One of the major perks of living in Germany is not only the proximity to all of Europe/Africa but also, the amount of holidays we get. And for Easter, we had both the Friday and Monday off to make a perfect little 4 day weekend. We've learned never to waste a long weekend, because within those 4 days, you can experience the most amazing things in the world... and this time we really did. Cairo, Egypt. Just two - 2 hour flights away (with a quick layover in Istanbul). 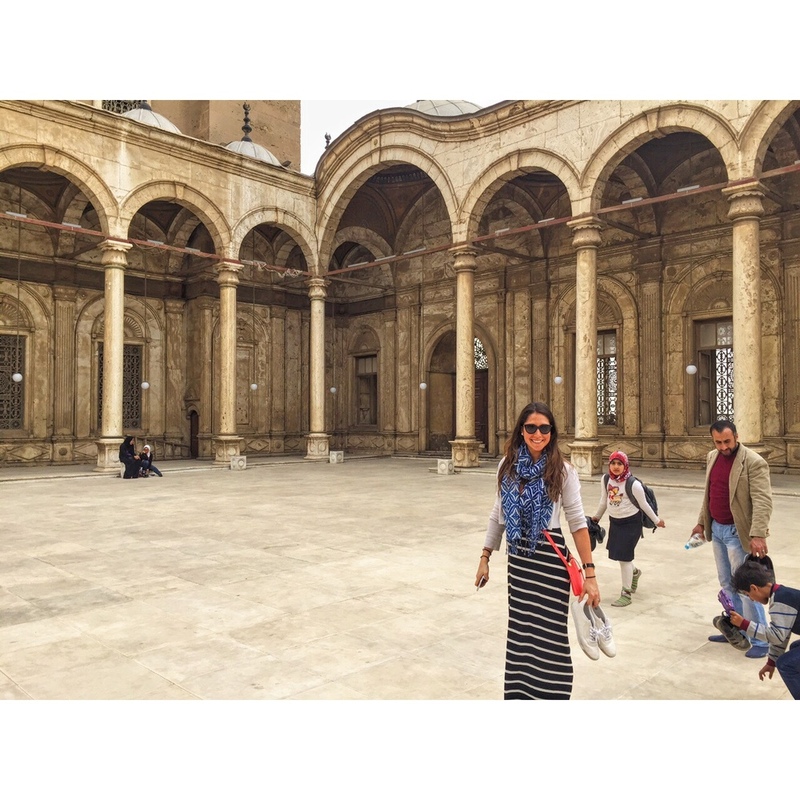 In this post, I wanted to focus on the questions that we were asked before, during and after traveling to Cairo. I have written separate more detailed blog posts on our trip to the Egyptian Museum and visiting the pyramids. Did we feel safe there? 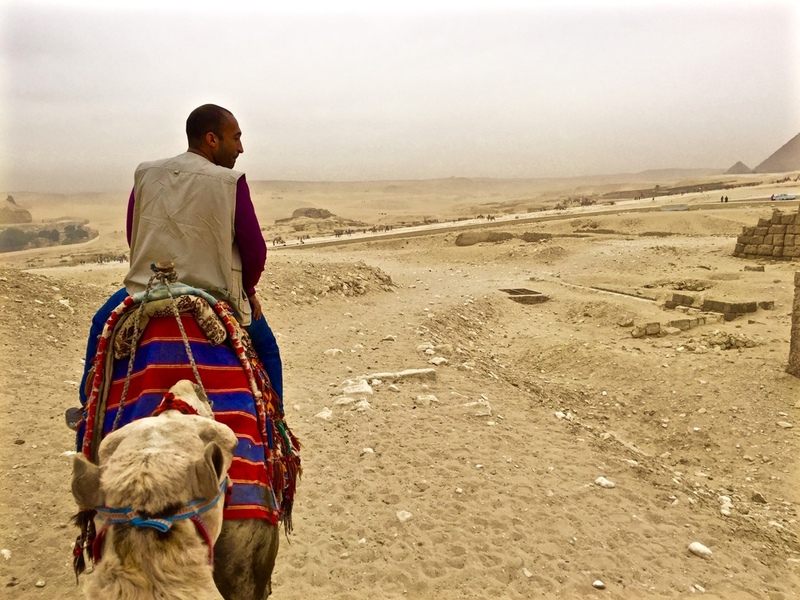 Before we traveled, I researched the news like CRAZY about Cairo. To the point that I probably scared myself a little bit too much, but i just wanted to be aware of whats happened in the past and in the surrounding areas. So I'll admit, most of the time when i was feeling a bit nervous, it was all in my head. It is just that feeling that you are in the middle east and anything could happen at any moment. But then again, the weekend before we traveled, there was the situation in the Brussels airport... so its getting to the point that it could happen anywhere... but that shouldn't stop us for exploring the world. Before traveling I researched on the US Embassy of Cairo website. They give you up to date news for travelers, advisories on the cities you're visiting (like the picture below, which i'll admit scared me a bit!) I also enrolled Andrew and I in what they call STEP (Smart Traveler Enrollment Program). I basically filled out all of our info, what flights we were taking, the hotel we were staying at, etc, and they will text/email if there is important safety/travel updates, evacuation plans incase of emergencies, etc. Most likely not necessary, but you can never be too prepared, right? But... I figured i'd rather not leave anything up to chance, so i booked practically our entire weekend with EmoTours. From the pick up at the airport, to tours through the Egyptian Museum & the Citadel, and then camel rides & dune buggies around the pyramids. Every morning they'd pick us up at our hotel, we had a driver & a tour guide (Ahmed... such a great man! ), they provided drinks, snacks, tickets to the museum... everything. And this was one of the greatest decisions we made... they are what made us feel safe and at ease. I highly recommend them to anyone traveling to Egypt. So... did I actually answer the question of "did we feel safe there?"?? I guess I still haven't. While we were traveling through the city, there were some points where we felt a little unsafe. But I think it was also because we were experiencing things we never have before. Like seeing security/army men in full bullet proof vests standing behind bullet proof walls (see pic below), that our car was searched for bombs every time we'd get to our hotel, and the fact that EVERYWHERE we went had a metal detector. These were all things that made me feel safe & unsafe at the same time. But the truth is, Egypt is somewhat of a conflict zone at the moment, so before booking travel do your research and make sure you are comfortable with all of this. And if you decide you do want to travel there... get ready because it is one of the most unbelievable places you will travel to. Was it hot there & what did you wear? I think the reason I got asked if it was hot was because in all of my pictures I was wearing long sleeves/scarfs. To answer the question... we were in the middle of the desert... of course it was hot! I think it got up to 90 degrees fahrenheit (32 C) one day. But, because we were in a Muslim country... it is respectable for women to dress more covered than in a western country. Which, for them means everything covered except for the face and hands. (i'd say 90% of the women I saw were wearing head scarves) and yes, we'd see women wearing full burquas. For people just visiting, you of course don't have to follow this, but I didn't want to offend anyone or bring unwanted attention towards myself, so I covered as much as I could despite the heat. I read a lot about women traveling alone and getting harassed, luckily I never experienced this, but I can also attribute this to dressing modestly and having Andrew by my side the entire trip. A scarf: (you can see it tied on my bag in the picture above), its good to have just incase you want to visit a mosque and you have to cover up more. A cardigan: Perfect for when you need to cover up, but easy to take off when your inside your hotel and you don't need to cover your arms. What is the city center like? Is there still a lot of garbage in the streets? The city itself is unlike anything we've ever seen. Loud, hot, chaotic and full of life. But the most unfortunate thing that we noticed was the amount of garbage everywhere. It was literally on every street, piles of garbage. People would drive by and throw it out their window. And you'd see dogs and cats just picking through it looking for food. It now makes me appreciate the German obsessiveness with garbage & recycling. What area of Cairo did you stay in? 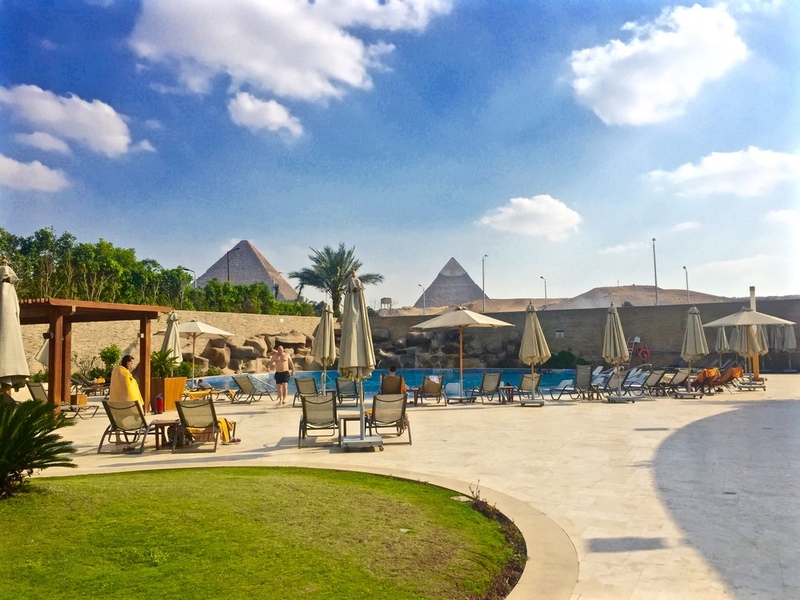 When looking into hotels, there were several different options.. stay near the airport, stay in the center of the city, or stay near the pyramids. After a lot of researching, we decided to stay near the pyramids. We honestly made the decision because we wanted to look out our windows and see the pyramids. But it ended up being such a great decision because the center of the city was so hectic and loud... it felt good to step away into our own little safe haven. And check out the view from our pool, not bad right? I read about this A LOT when researching Cairo. It seems that since the tourism has gone down massively, the "touts" try to scam as much money out of you wherever possible. It seems it happens most with taxis, in the pyramids areas, or basically most tourist sites. But because we booked everything through Emo Tours, we actually never experienced any scamming. How did you plan your trip/what sites do you recommend seeing? I planned the entire trip through Expedia. And I am an obsessive travel-blog-researcher before we go anywhere so I studied up quite a bit. And like I said, I booked all of the tours through Emo Tours, which ended up being the best decision we made. We ended up planning our days the most perfect way out of pure luck, which is why i wanted to write this down for others since it worked out so well. Day 1: (despite the lack of sleep) Full day tour of The Egyptian Museum, Cairo Citadel and Old Cairo. Day 2: A 4 hour tour of The Pyramids of Giza by camel, and then dune buggies around the pyramids. Day 3: Relaxed morning by the pool then the Khan el-Khalili market in Cairo. We loved getting all of the "learning" in on the first day. That way when we were in the burial chambers on the second day, we could imagine all of the treasures that used to sit in that room (that were now in the Egyptian Museum) which we saw on the first day. And it was also nice to just have fun and let loose on the second and third day. Also, if you have more than just a weekend, I recommend visiting Luxor, the pictures look AMAZING. Can you drink the water in Egypt? Personally, we didn't. I've traveled to Asia too many times with work and have seen coworkers get stomach bugs for several days. Knowing we were only going to be in Egypt for a long weekend, I didn't want to have the entire trip ruined. When we booked our Asia trip (still to come in May), I had read about this water filtration water bottle called Clearly Filtered. Andrew and I are both big water drinkers, and it just seems like big waste to constantly buy new plastic water bottles and then throw them away. This water bottle has the filtration system built in, so when you take a sip, it is simultaneously filtering the water. (and its safer and cleaner than a Water Bobble filtration system). Visas: As an American, we needed a visa in our passport. But its extremely easy, it just cost $25 (US Dollars, make sure you bring exact change), and you pick it up literally steps before going through customs after you get off of the flight in Cairo. Taxis: We were told only take the white taxis, and make sure that it has a working meter. Otherwise they may try to scam you. (but again, we did all our traveling through Emo tours). Crossing the streets: ugh... I don't even know how to give you tips on this one. The traffic in Cairo is unlike anything i've ever seen. There are NO RULES. We literally saw someone driving the opposite way in traffic. To cross the streets are just as ridiculous. If you watch the locals, they just begin walking and hope someone doesn't hit them. Thats basically how you do it! So for us, we would just wait for a local to start to walk, and walk beside them. Money: They use Egyptian Pounds (but we also found they will take US Dollars, Euros or British pounds). But make sure to keep some smaller egyptian pound change with you. You'll find yourself giving out lots of "baksheesh", or tips, and you don't want to find yourself without smaller bills. And then good vocabulary words to know in Egyptian: (below is the notes that our tour company wrote down for us). How much is this? : bikam da? All in all, out of all the places we've visited since living in Germany, it was by far the most eye opening and memorable experiences of our lives. Read about our experiences at the Egyptian Museum & Pyramids in my later posts.